Congratulations to Prof M Stanley Whittingham. Materials science is not only one of the fastest growing and most rapidly evolving scientific disciplines, but also one that stands at the forefront of modern technology, spanning every facet of 21st-century life. The Materials Today Innovation Award recognizes leaders within the field of materials science and related disciplines who have brought materials science to the fore and advanced the field through cutting-edge research and thought-leading insight. The Award seeks to recognize researchers who have contributed “monumental” work, which has opened a new, significant field of research and resulted in impactful, practical applications. As selected by the Editors of Materials Today and Materials Today Advances, we are delighted to announce that the inaugural award will be presented to Prof M Stanley Whittingham (Institute for Materials Research and the Materials Science and Engineering program at Binghamton University) at the MRS Fall meeting in Boston this November. 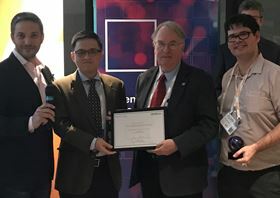 "Professor Stan Whittingham has made monumental contributions to the development of lithium-ion batteries that power today's smartphones, laptops, drones, electric vehicles and more", comments Prof Gleb Yushin (co-Editor in Chief, Materials Today). "Stan was the first to study lithium ion intercalation and developed the first prototype of rechargeable intercalation-type lithium battery in the 1970s. His pioneering research discoveries transformed energy storage technology and impact almost everyone on the planet. The impact of his innovation continues to grow rapidly, year on year, as the inevitable transition to battery-powered transportation and renewable energy harvesting technologies reshapes our world toward a better energy-sustainable future." Please join us in congratulating Prof Whittingham. Plastic 3D printing company BigRep has been named a winner of the German Innovation Award 2018. The MPIF reports that judging for the 2018 Powder Metallurgy (PM) Design Excellence Awards was recently completed. The MPIF has announced the winners of the 2018 Powder Metallurgy (PM) Design Excellence Awards competition.